Gardening up here in this part of the world can be more of a hit and miss, frustrating business than it is further south. The weather more often than not is cold, wet and windy, with particular emphasis on wind! The winds are not infrequently rather strong and laden with salt, picked up from the Atlantic Ocean which is barely a mile away here. 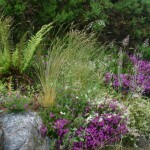 Plants generally are not partial to salt-laden winds! The only real way to mitigate this problem is to build shelter of some sort. 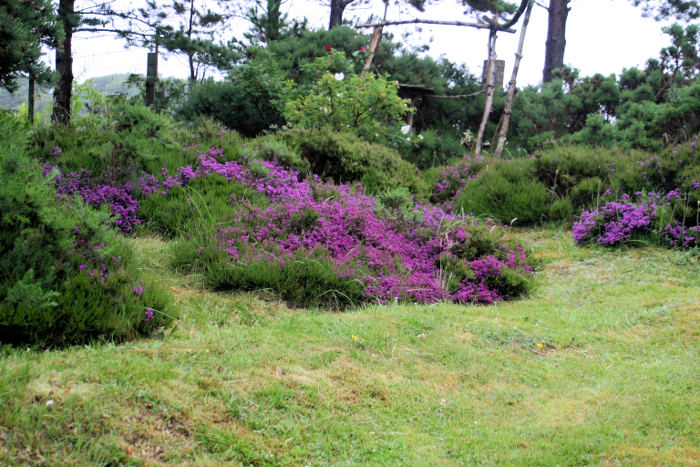 My friend, Theresia, in Drumbeg was able to plant a lot of shrubs, but she inherited the in-bye land of a croft which had had little done to it – except that it had been well manured over the years! We inherited a “shelter belt” of pine trees and when visitors to the house see them they say “Oo, you have a nice bit of shelter here” but in fact trees that have bare trunks for 10 or so feet don’t actually make a very good shelter barrier – shrubs are much more efficient at breaking the wind! You can tell our garden is not very sheltered by the fact that we don’t get a lot of midgies. If you create good shelter for your plants, you also create midge heaven!! Then there is the rain! Recently, while further south and east they were baking in what were really rather too hot conditions, here it was much cooler and we were getting a lot of what we call “Scotch mist” which is fine rain blown in on the breeze which more resembles mist than rain. In fact, some days we had real mist rolling in from the sea. Not har – as some folk think – as that is an east coast phenomenon. I have experienced both and they are different from each other. So, I reckon that it is really rather amazing that our gardens do as well as they do! 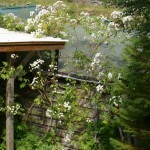 Many people round here have polytunnels – set in reasonably sheltered spots and well bowsed down! We have a big greenhouse, which is in fact made of plastic and is fairly windproof. In there, I grow things like tomatoes and chillies which you couldn’t grow outside, but also carrots and mangetout peas which can be grown outside, but growing them in boxes in the greenhouse gives us an early crop. This year, probably because it was so cold in the spring, there was no germination among the carrots either inside or out! I also grow Chinese veg indoors, outside up here they don’t survive the wind or the snails. Being a rather damp climate – excellent for mosses and ferns – we also get more than our fair share of slugs and snails. Snails I live with partly because they are rather attractive in their snaily way, but also because they bring the thrushes into the garden. Piles of broken snail shells prove that the birds are doing well! Slugs I do do something about as even keeping the greenhouse free of them can be a problem! We have very few of that voracious eater of slug, the hedgehog. Roses of course don’t like too much wind or wet, and mine have struggled on occasion. 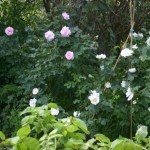 But it has been another superb year for flowers, and the roses are no exception. They do suffer black spot as the air is rather clean and unpolluted here, but only rarely have any of the buds rotted off the bush due to wet, possibly because they are always that bit later than down south. My sister complains like fury when a wet summer ruins her display of roses!! Well, as I said, we have had it fairly wet and chilly in recent weeks and unfortunately last Wednesday evening was no exception, and that was probably the reason for the rather disappointing turnout for the Friends of Assynt sale in the Village Hall. In fact, I had noticed that a holiday house down by the loch – named inventively “Lochside”:-) – had smoke coming out of its chimney, and I thought that the people were probably sitting snug around the fire and were unlikely to venture out! Gwen had roped me in to help set up in the afternoon and then run the “Guess the Teddy’s Birthday” stall. It had been fun setting up, all the folk who had turned up to help knew what they were doing, and as the afternoon wore on, the tables filled with stuff. There was the normal, popular assortment of bric-a-brac, second-hand books, home-baking, tombola and raffle, and my stall was an addition because we had been given a beautiful big teddy. Its only problem was that it was dressed in Christmas clothes, but at 20p a go, that didn’t seem to deter people from having a go at guessing its birthday, and the old, torn up calendar we used for this quickly filled up with names. All in all, it was a lot of fun and we raised £700 including donations, which I reckon is not at all bad, especially considering that not so very many people had turned up. Of those, the majority were locals although there were some holiday makers, mostly families. One family did particularly well winning not only two good raffle prizes, but the teddy! The plus side to there not being so many folk in the hall was that there was plenty of room for folk to sit and enjoy the cuppa and cake that came with the entrance fee of £2.00 (50p for children). I had buttered and jammed a whole heap of the lightest scones made by Maureen Scott, and the refreshments were certainly cheap at the price! I enjoyed the whole thing but I reckon that this was partly because I was doing what I was doing. I didn’t mind persuading people to part with their hard-earned cash for that, and all in a very worthy cause! This entry was posted in Local area, The elements and tagged climate, weather. Bookmark the permalink.